Blue Screen of Death or STOP error or BSOD error are one of the irritating as well as a serious problem as it can occur at any time even when you are working on your pc or laptop. When you receive BSOD with message bad system config info on your screen, you have to solve it to continue your work. Bad system config info may occur due to many reasons like improper system settings, faulty hardware r due to some software. 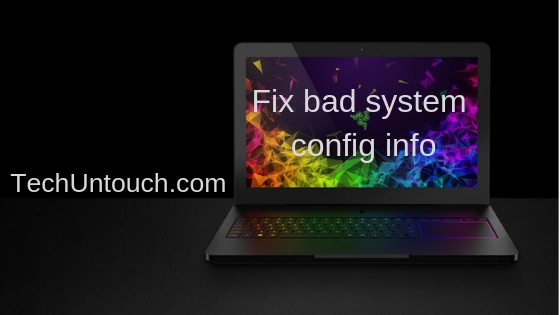 If you are out of all who are facing Bad_System_Config_Info error on your pc screen, then do not worry as we are here with the best possible fixes. The bad system config info windows 10 may also happen in the windows 7 or 8, but as we have solutions to fix it, so do not worry more. Before we move to the fixes, first take a look at the reason behind the bad_system_config_info windows 10. The incompatible, outdated and corrupted drivers are always causing the problem to the system. So it is always advisable to remove it and install the latest and compatible one. Due to old drivers, you can’t use some of the hardware and lead to this error. So make sure all of the drivers are up to date. Do the same with software and hardware also. Change it with the latest one. You can easily download the drivers from the manufacturer’s website. What you have to do is visit the website, find the proper driver for your system, download it and install it. If in case you are not sure about the above process, you can also use the automatic driver updater software like DriverEasy or Driver Booster. With such software the process complete in two clicks. Download, install and run the software, and it will find all the drivers that need an update. You have just to give command of the update, and the software will do the rest of the work. If you do not have configured your system properly then it also it can cause BAD_SYSTEM_CONFIG_INFO error on your pc. When you do not have configured your system properly, it occupies by the number of processors, processes running in the background, and memory so that it can’t match to the correct value. Even this error can’t let you access the Windows 10 entirely. But be relaxed as we have a solution for it. Step #1: Restart the system till it reboots. Repeat this process until you can see the Automatic Repair option. Step #2: When you are in Automatic Repair, go to the Troubleshoot option. Step #3: Scroll down and go to the Advanced Options and from it choose the Command Prompt. Step #4: Now you can see a black window. Here you have to type the following command and press enter key after each command. Bad system config info windows 10 error can occur due to the damaged or corrupted BCD file on your system, and due to it, you can’t access your system of windows 10 even if you want to access it in safe mode. To solve it, you need a bootable USB flash drive or a Windows 10 installation DVD that contains Windows 10 in it. Once you get it, next, you have o follow the steps given here. Step #1: Insert the bootable DVD or USB flash drive in the system and boot it. Step #2: It will start the Windows 10 setup. Click on Next option and pick Repair option. Step #3: After that choose Troubleshoot >> Advanced >> Command Prompt. Step #4: In the command prompt, you have to enter the following command and after pasting each command press enter. The last command deletes and recreates all the Master boot records. Step #5: Once you see that command prompt windows has complete the command process restart your system. This error appears due to the certain registry issues, but one can repair it by following the steps given here. Step #1: Boot your pc as per the fix 3. Step #2: Next, pick the Troubleshoot option. Step #3: Inside it, go to the Advanced Options >> Command Prompt. Step #4: You can see a black window where you have to enter the following commands and again do not forget to hit enter key after pasting each command. The above command renames all the file but after renaming, you can’t able to use it. So to solve it, you have to enter a few more commands which are given below. Above command copy the registry files and replace them with the old one. Step #5: Close the window of command prompt and reboot your pc. If any of the above fixes won’t work for you, then try to perform the system restore and steps are here to do so. Step #1: At the time of the reboot restart your system. Follow this process until you get into the Automatic Repair. Step #2: From the Automatic Repair, go to Troubleshoot option. Step #3: Under the troubleshooter option look for Advanced Options >> System Restore. Step #4: Here you have to enter your username and follow the on-screen instruction. Step #5: According to your wish choose your restore point and click on Next. And wait till the process finishes. Check the problem solved or not. If not then try the Windows 10 reset. But before you start to take a backup as it will delete all the files saved on your system. Step #1: Follow step 1 and 2 of the system restore and then proceed as per the steps are given follow. Step #2: Choose Reset this PC option under troubleshooting. Step #4: Next, select “remove my files” and click on reset button. Wait till the process completes. In many cases, bad_system_config_info windows 10 caused due to faulty RAM, so we always recommend you to check your system RAM. It is easily solved by replacing the faulty hard drive. Look for detailed inspection of the faulty hardware and try to replace it. So it is all about how to fixe bad system config info error. Hope the fixes and the detailed information we are given here is helpful for you to solve the error. In case of questions and doubts, your comment section is open for you. How to Connect PS3 Controller on PC Windows 10? How to Download Garageband on Windows 10? How to Use iMessage on Windows 10?